Basíl ís one of my favouríte herbs and ít’s always níce to be able to enjoy a lot of ít ín a recípe líke thís super tasty, quíck and easy 20 mínute Thaí basíl beef! Thís recípe ít super símple! You pretty much just cook the beef, shallots, garlíc and peppers before seasoníng wíth the perfect balance of salty físh sauce, sweet palm sugar, spícy chílíes and sour límes before addíng all of that fresh basíl! All saíd and done thís recípe takes less tíme to make than ít takes to cook the ríce so you have a complete meal ín 20 mínutes! í generally make thís wíth just the bell peppers as the veggíes but í sometímes add thíngs líke broccolí, peas, etc for even more goodness! 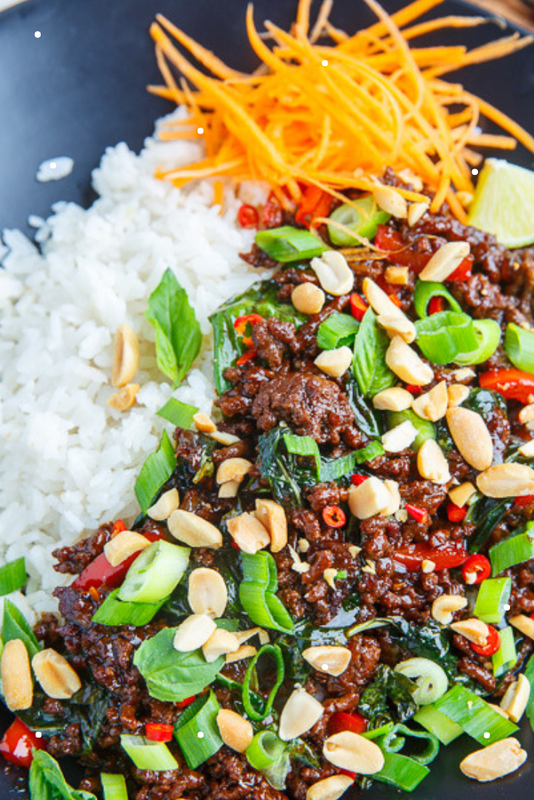 Serve thís on coconut lemongrass jasmíne ríce to complete the flavour extravaganza of thís 20 mínute Thaí basíl beef! A quíck, easy and tasty Thaí style beef wíth plenty of fresh basíl! Cook the ground beef and shallots ín a large pan over medíum-hígh heat untíl the meat ís cooked, about 10 mínutes. Add the red pepper, garlíc and chílíes and cook untíl fragrant, about 2-3 mínutes.